I have just finished writing my seventh book. 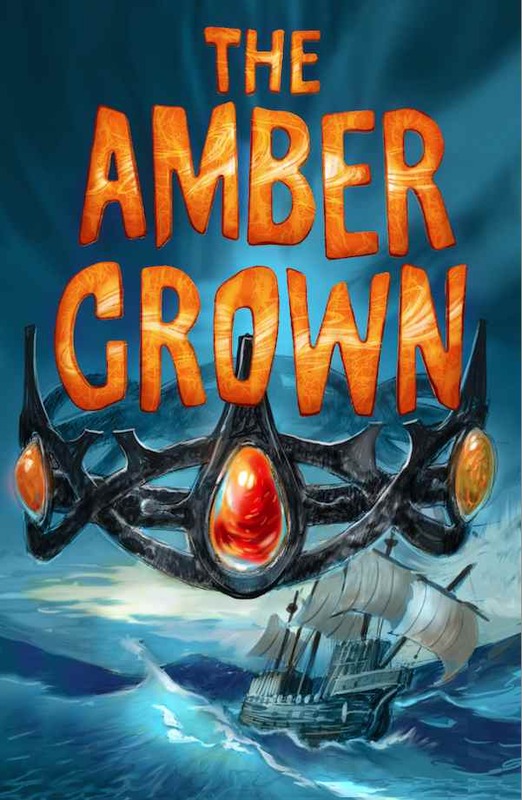 It comes out in March, and it’s called The Amber Crown. It’s the last book in a trilogy – my previous four books were a series set in the time of King Arthur, with a would-be wizard, Max, his sister Olivia, who wants to be a squire, and various animals, knights, wizards and squires. The Amber trilogy is partly set in our world, and partly in various other worlds – and at its heart are four mysterious amber jewels with the ability to transport people between worlds. Seven books is quite a few, and you’d think that along the way I’d learned a few tricks about writing. But I realised as I got to the end of The Amber Crown that there was one simple mistake I had carried on making through all seven books, and that had made my writing life a lot harder than it might have been. I invent too many characters. I find it hard to resist. I started Frogspell, my first book, with just four main characters: Max, Olivia, Olivia’s pet dragon Adolphus and Max’s pet rat, Ferocious. Then Merlin somehow crept in. And Max’s dad Sir Bertram. There was the evil Morgana le Fay – and she needed accomplices. So suddenly I had Snotty Hogsbotttom, Max’s main rival, and his father, Sir Richard. King Arthur had to appear, of course, and that seemed enough to be going on with. But then there was a second book, and somehow Lancelot found his way into the story, along with an ancient dragon called Great-Aunt Wilhelmina. In the third book a rather haughty duck called Vortigern strode into the story, and in the fourth I couldn’t resist having my favourite Arthurian knight, Gawaine, make an appearance. Along with Guinivere, of course. All these extra characters made the final scenes rather difficult to manage – everyone wanted to have a role, and a say in what happened! You’d think I’d have learned from this. 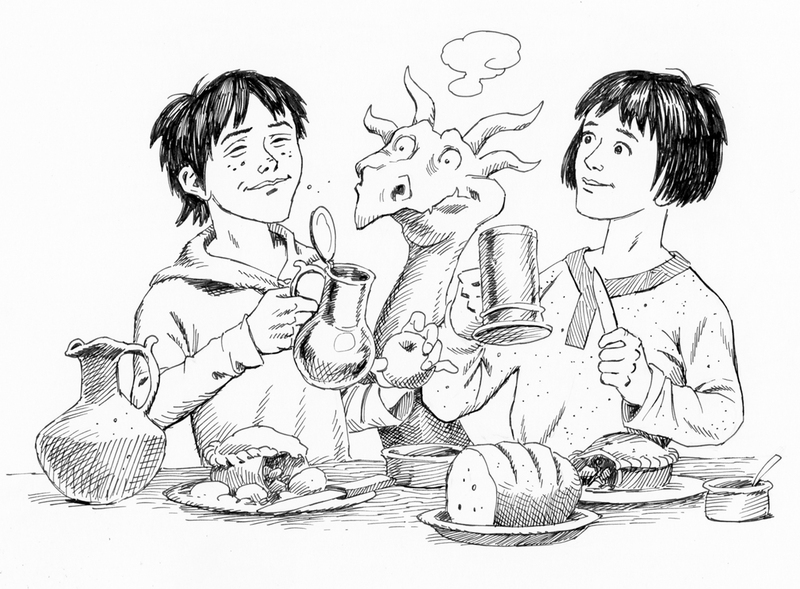 But no – the new trilogy, Deep Amber, started with four main children, in two different worlds. Simon and Cat live in an ordinary town in England – Dora is an apprentice witch in a castle in the Kingdom, a fantasy world with magic and knights, and Jem is the castle kitchen boy. They meet when a rift opens between the kingdom and our world. A pair of swimming goggles and a camera appear in the castle, while a longsword appears on the stairs in Simon and Cat’s house. Eventually a knight on a white horse stumbles through the rift, and ends up in Simon and Cat’s cellar. 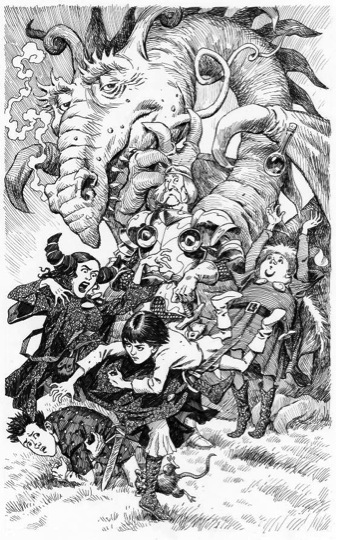 The final scenes of the book involved the knight, Sir Bedwyr, two dark-suited baddies, Mr Smith and Mr Jones, the enigmatic Lord Ravenglass, a druid, an odd-job man called Albert Jemmet, a ghostly great-aunt, and all four children. As if that wasn’t enough, over the course of the next two books I managed to add Simon and Cat’s mother, an exotic princess from the Akkadian Empire, a dashing pirate, a doddery but highly magical queen and a small blue caterpillar-like creature called Caractacus. I realised that I had a serious problem when it came to getting all my characters to the final showdown. They would’t even fit in a minibus! I had to invent a plot twist that meant I could send half of them up there by van and the other half by train. I needed a diagram to remind me who was where! So now I’m writing a new book, and I told myself I’d learn from my mistakes. There’s going to be just two main characters. A boy, Ben, and his cousin, Jess. Oh, and Ben’s little sister Dell. And of course, six Norse gods. And a frost giant. Plus a few valkyries. And Jess’s mum and dad. See? Simple! Tags: characters, fantasy, plot, writing advice. Bookmark the permalink. Previous post ← Standing up for yourself!